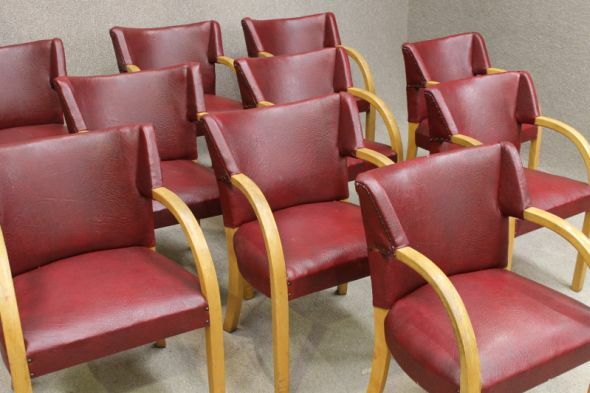 A fantastic opportunity to buy a large set of art deco chairs. The chairs have been recently acquired from a local small private theatre where they have been used for many years. They have been reupholstered during their lifetime in a warm red leatherette style material which is all in fairly reasonable condition. There are odd small marks and little tears to the backs of some of the chairs but not all. These chairs would look spectacular if reupholstered in a cream leather style material. An ideal set of chairs for any collector of this style of furniture. All chairs are structurally sound with no loose joints or woodworm. Please note, we also have another identical set of 10 art deco chairs for sale. Please see our other listings.